A comprehensive study that investigated the sources and extent of nitrogen fallout on Tampa Bay shows that cars, trucks, and other mobile vehicles deposit four times more nitrogen oxide, or NOx, in Tampa Bay than power plants. Overall, power plants are the major sources of air emissions in the bay area. But mobile sources have a disproportionately large impact, because emissions from cars, trucks and boats are generated closer to the ground, and more of their emissions wind up in the bay. The tall stacks of power plants, on the other hand, send emissions higher into the atmosphere, where a substantial portion is carried outside the bay watershed. The study, known as the Bay Region Atmospheric Chemistry Experiment, or BRACE, utilized computer modeling and extensive field sampling to measure nitrogen falling directly on the bay surface, as well as nitrogen falling on the watershed and carried to the bay in stormwater. The study examined nitrogen carried in both rain (wet deposition) and dust (dry deposition). TBEP sponsored the project, led by Dr. Noreen Poor, a noted air pollution researcher. Funding was provided by the Florida Department of Environmental Protection. TBEP has pioneered scientific research showing the link between air and water quality. In addition to impacting human health, air pollution can contribute harmful nitrogen to water bodies. 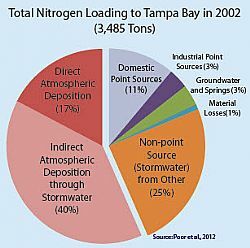 In Tampa Bay, direct and indirect atmospheric deposition comprise a whopping 57% of the total nitrogen loading to Tampa Bay each year. In the last decade, upgrades at area power plants -- including the conversion of two coal-fired plants to natural gas -- have reduced NOx emissions by 95 tons. Additionally, new federal air quality regulations, including the Clean Air Interstate Rule, are projected to result in a 24% reduction of atmospheric nitrogen in the bay. Conserving energy at home and in our offices, driving less and driving more fuel-efficient cars will help to further reduce airborne nitrogen pollution. According to the U.S. Environmental Protection Agency, driving a car is a typical citizen's most polluting daily activity.